John Kardinairo finds himself magically transported to the strange land of Ather where he must find the mysterious Golden Book in seven days. Thunderstruck by an enigmatic bookstore owner, John Kardinairo finds himself magically transported to the strange land of Ather. 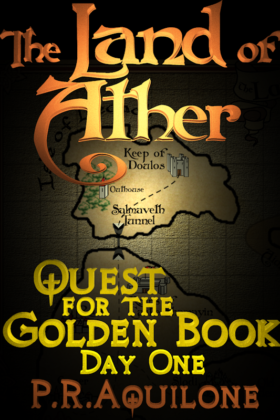 Challenged to find the mysterious Golden Book in seven days, he reluctantly begins an adventure with the help of Lord Mathetes, who once almost completed the same quest. Accompanied by Burech, a fairy-like person who knows all too well the evil that lies in wait, John struggles to survive while defying the fearsome Zanachs to save a woman’s life. Will he fall victim to the evil Lord Aquzar’s clutches or rise victoriously to achieve his quest? Book 1 of the Quest for the Golden Book series.